From left Ms. Erika Hasznos, First Secretary, Ms. Laila Jasmin Banu, Programme Manager-Governance and Human Rights, Ms. Audrey Maillot, Team Leader-Governance of the Delegation of the European Union to Bangladesh, Editor of News Network Mr. Shahiduzzaman and senior journalists and media development expert Mr. Shamsuddin Ahmed are seen in the picture. 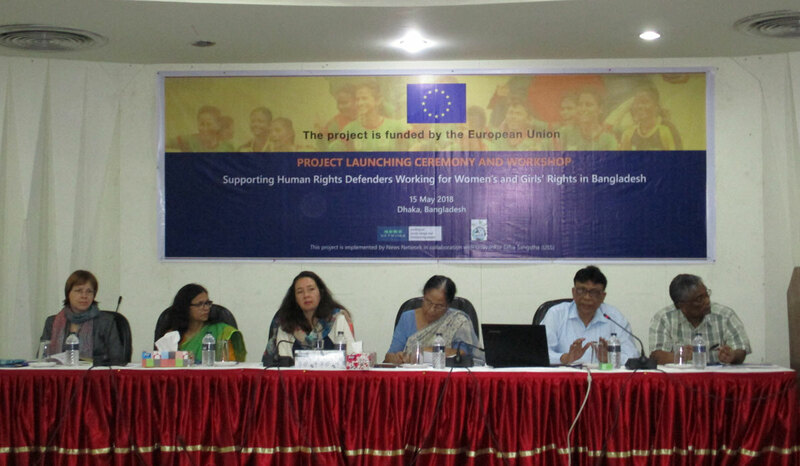 A three-year long European Union funded new project, ‘Supporting Human Rights Defenders Working for Women’s and Girls’ Rights in Bangladesh’ launch today. It’s a first of its kind project to improve the professional ability of human rights defenders, including journalists, representative of Civil Society Organisations (CSOs) and NGOS, and religious leaders, aims to protect and promote women’s and girls’ rights in Bangladesh. News Network in cooperation with Udayankur Seba Sangstha (USS), a non-government organisation is implementing the project in country’s 8 districts (Jessore, Satkhira, Nilphamari, Lalmonirhat, Rangpur, Dinajpur and Kurigramme). The launching ceremony of the project held this morning at CIRDAP Auditorium, Dhaka was Chaired by Ms. Audrey Maillot, Team Leader-Governance of the Delegation of the European Union to Bangladesh. Mr. Shahiduzzaman, Editor of News Network presented the project and moderate the event. Ms. Ayesha Khanum, President of Bangladesh Mohila Parisad and Mr. Shamsuddin Ahmed, a senior journalists and media development experts were attended as the guest of honors. Ms. Erika Hasznos, First Secretary (Political) and Ms. Laila Jasmin Banu, Programme Manager-Governance and Human Rights of Delegation of the European Union to Bangladesh and Mr. Alauddin Ali, Executive Director of (USS) also present in the occasion. Audrey Maillot said, ‘News Network has been awarded the project under the European Instrument for Democracy and Human Rights (EIDHR). ….EIDHR is a European instrument that aims to promote democracy and human rights worldwide through support to civil society initiative’.